*Your home’s entrance should receive special attention as it represents both your approach to life as you walk out, and your impression as you walk in. Keep it as clean, beautiful and clutter free as possible . *Anything broken should be fixed, or if it can’t be fixed, recycled into something useful. Otherwise, throw it out! *The same goes for furniture that looks bad or that you never use. 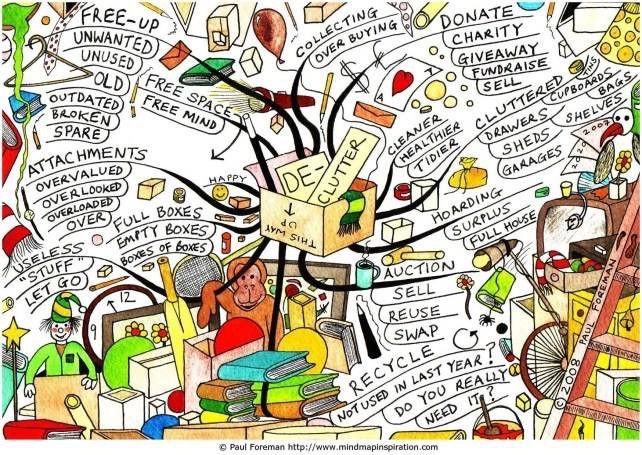 Ditch it, sell it or give it away; consider getting rid of objects that conjure up sad or unpleasant memories, too. If you’re not sure about heirlooms or valuable items, pack them away in a labeled storage box and reassess after a year. *Unhealthy plants should be given some special TLC in the garden or completely removed from your home. While you’re at it, toss any dried flowers and ditch cracked or rusty pots. Dying plants are a negative influence, so don’t put it off! *Stray paperwork should be collected together and collated. If you don’t already have one, buy a filing cabinet or try an expander file. Alternately, create a ring binder especially for bills, or set up an in/out-tray near your computer. You’ll feel organised in no time! *Books, magazines and DVDs that you’re unlikely to read or watch again should be given away. Clear some space for fresh stories to enter your life. *Wooden furniture can exude a strong psychic resonance, so if Aunt Olive’s oak wardrobe doesn’t hold particularly fond memories, consider selling it or move it into the spare room. At the very least, give it a good cleansing with sage smoke. Your bedroom should be your special sacred space. *Clothes that don’t fit or haven’t been worn for a couple of years should be donated to charity, sold or given away. If you’re not sure, pack them into a box and open it after a year. The same goes for shoes and accessories – donate them, toss them out, or pack them away in a labeled, dated storage box. If you don’t open the box within a year, don’t bother opening it, donate it. *If your linen cupboard is bulging at the seams, set aside a couple of hours and empty it. Again, donate, give away, trash or box items for a year. *Tackle cupboards in the kitchen, laundry and bathroom too. For a healthier living environment, out-of -date foods, cosmetics and chemical cleaners should all be ditched. *Artwork that makes you feel sad should be sold, or if you can’t bear to part with it, moved to an out-of-the-way room. Seeing a sad, ugly or lonely scene every day will eventually rub off on your psyche. If you want to invite more harmony and joy in your life, opt for feel-good artwork.